In the near future, there exists a digital world called OZ which has become so integrated into our daily lives that everything is managed through it; from politics through to business, global infrastructure and emergency services. Simply sign up, create your carton avatar and enjoy a rich online environment where everything is at your fingertips. Of course, having everything in one place means security is paramount, as anyone who cracks the system will effectively rule the entire world, and it just so happens those keys have been handed to an artificial intelligence that simply just wants to have fun. Summer Wars may sound like a dark post-apocalyptic disaster movie where a rogue AI destroys the world, but instead it is a refreshingly unique science fiction film rooted as a social commentary of family, connections and the benefits and pitfalls of an all-digital future. The film is directed by Mamoru Hosoda, coming off the back of his highly successful The Girl Who Leapt through Time; although his influence is most apparent through his work on Digimon, with the avatars and digital world of OZ taking clear inspiration from the children’s franchise. It’s an approach that works well, creating a believable system that you could see working with today’s current technology and one that is beautifully animated. OZ’s exterior is designed to look like a menacing monster itself, and the inside, while carrying various amenities like shopping centres and government offices; feels like a child’s playroom, with shelves stacked with books and tables and music players in the background. It’s simply an incredible amount of detail that’s easily overlooked with the white background that makes it nice and crisp, but at times overly bright. While the world of OZ is a foundation stone, it doesn’t necessarily take centre-stage, as the film tends to focus on the human elements of the story, exploring what effects the digital world has over the physical as control tumbles away. To bring us to that point, we have our generic anime kid, Koiso Kenji. The seventeen year old high schooler works alongside his close friend Sakuma Takashi as a moderator of OZ on the lowest rung of the ladder. As a lead he’s very uninspiring, with only his outstanding maths skills going for him, but he develops emotionally well over the course of the film thanks to its well-constructed plot. After winning a game of rock-paper-scissors, he’s towed along by Shinohara Natsuki; close friend, upperclassman and immediate love interest candidate; to her family home in Ueda. There’s always a catch, however, and this time Kenji has to pretend to be Natsuki’s boyfriend over her great-grandmother’s 90th birthday celebrations due to a promise that she’d introduce her to her future husband. 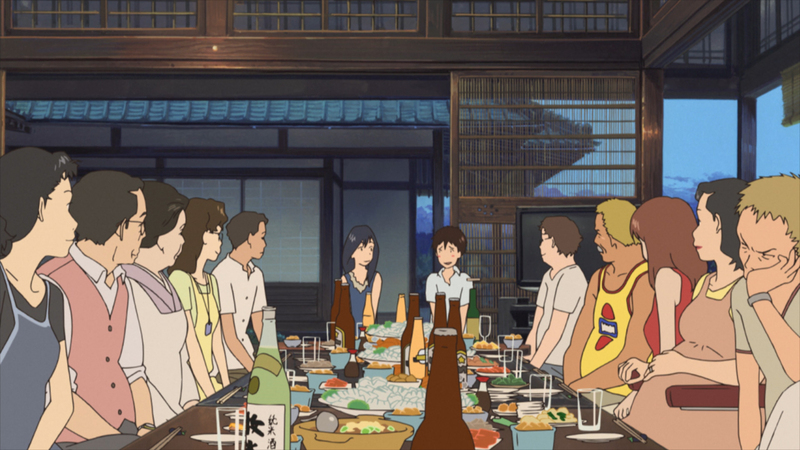 Natsuki’s large family is offered as a contrast to Kenji’s small, absent one, focussing on the importance of familial ties and keeping people together. While it’s easy to portray a large group of people, it’s difficult to do so in a way where each character stands out on their own. And that’s an important thing to focus on in this large group. There’s a fisherman, a Self Defence Force officer, a computer shop owner, a trio of firemen, then there’s the plump middle-aged woman who watches her son playing competitive baseball on TV, and then there’s the young kids that are brought along who stampede through the house as kids do. It’s a huge, busy and bustling gathering that feels warm and brought close by a special event. 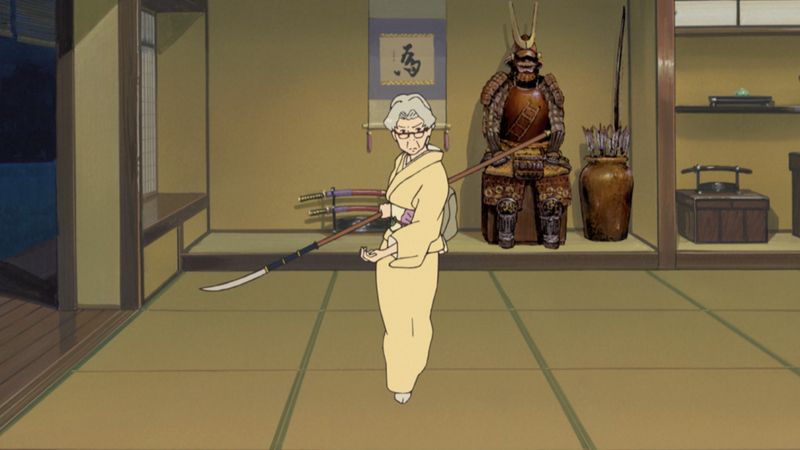 There are a couple of the women that feel like they just hover around in the background, but the majority of this large cast each have something to give individually; and none more so than Natsuki’s great-grandmother, Jinnouchi Sakae. This woman is one powerful character not to be messed with; kind and accepting, but with a sense of upholding her own beliefs and values. Even without modern gadgetry, with her wisdom and connections she’s able to reach out to bring people to their senses in battling the crisis that they find themselves in. It’s a statement that supports a best of both worlds approach, revelling in the digital age with the use of social networking, but also having a place for more traditional methods of communication. This theme of constant balance and presenting different forms of communication in an unbiased manner is what makes Summer Wars fresh over many other tech-based tales internationally. While technology can be used maliciously, it isn’t the be-all-and-end-all as it can also save the world. While this critique is an integral part of the story, it’s just one part of this epic summer blockbuster style film. There’s a bit of intrigue and mystery, as Kenji is initially blamed for the situation after solving OZ’s security code, and Natuski’s half-uncle appears to know more than he is letting on. There are tears and anxiety, as things fall apart; and some gripping action sequences as Kenji gives everyone a metaphorical slap in the face. The action is provided mainly through the digital world of OZ, as Kenji challenges the AI, dubbed ‘Love Machine’, with the aid of digital martial arts champion Ikezawa Kazuma and his avatar King Kazma. There’s a variety of these and are pulled off with a flair that evokes 3D fighting games like Tekken or Dead or Alive, but are more fantastical as we get to fly around OZ, and it is in these scenes where we see that well-designed digital environment. And it’s not just fighting games that get a shout-out in the world of Summer Wars, as the card game hanafuda also features heavily, once again brining the old alongside the new. 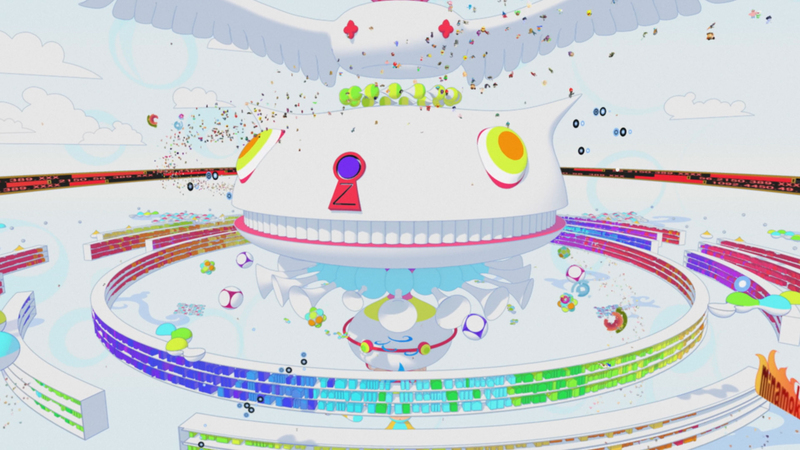 In a piece where this huge mass of content is going on, it’s often hard to maintain a balance between the slower paced scenes and the action, yet Summer Wars has a great flow to it that ensures that you never feel bored or are waiting for the film to hurry on with its climactic scenes. There’s a number of key twists, some expected, some surprising, but the way control switches from Kenji’s party to the AI and back again feels like a war, as battles are lost and won in both real life and the digital world. It’s fascinating to watch events play out and grips you right to the end. 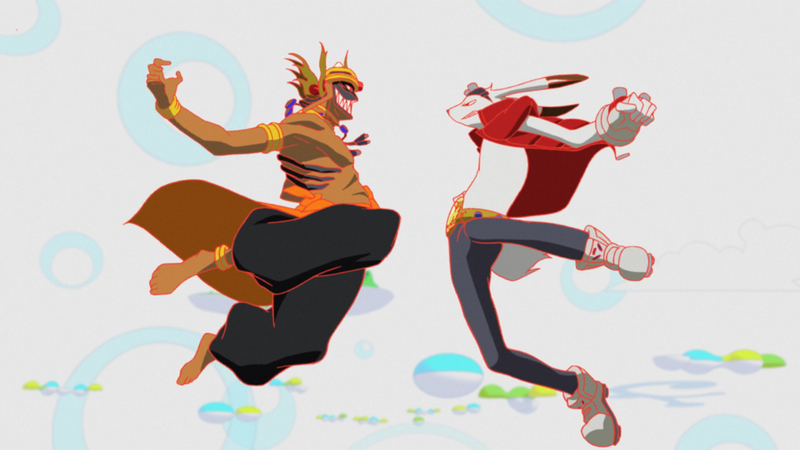 Summer Wars then, is a classic, masterful piece of work that is Mamoru Hosoda’s breakthrough defining moment. While working well as a smile-inducing summery blockbuster, it offers a balanced critique of the real-digital divide and puts forward an idea of a future where the people using technology can solve technology’s problems using traditional methods, all the while valuing both physical and digital communication. It’s beautiful and human, and if you can’t enjoy at least some part of this, you’re clearly a robot.